1. Container offices are efficient in square-footage. Efficiently running a warehouse means making the most of your square-footage. A 20-foot shipping container has a 160-sqft footprint that you can strategically place either in your warehouse or parking lot. In some situations, you can even stack containers to liberate more floor space. 2. They create a warm, quiet place to work in a chilly warehouse. Warehouses can be sweltering in the summer or freezing in the winter. and the acoustics tend to echo the beeps and hums of machinery. If you need to do answer emails, numb fingers are the last thing you need. 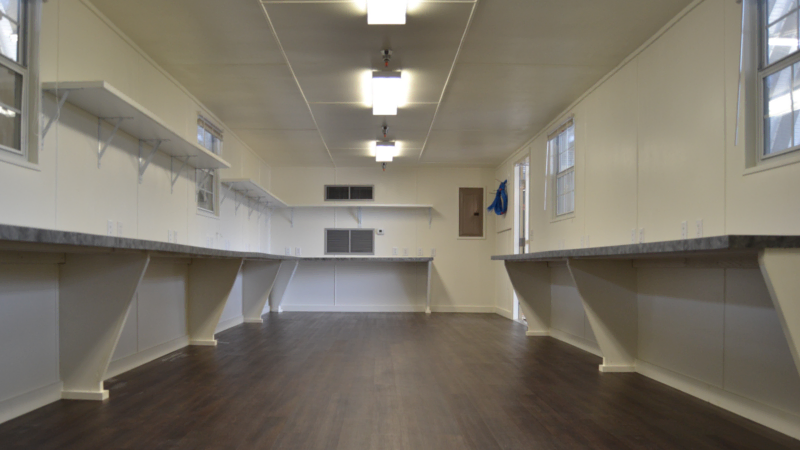 An insulated container office can create a room-temperature work space where you can focus. Container offices can also be modified to have large windows, so supervising employees can keep an eye on the floor while handling administrative tasks. 3. You can conduct business with visitors in a polished work space. When warehouses have limited (or non-existent) office space, it can be awkward finding a quiet, and climate-controlled space for meetings. Container offices can double as conference rooms where you discuss business with customers and business partners. If you place the container inside your warehouse, visitors can look out the windows to see your operation in action from the comfort of a warm office with polished interior finishes. 4. 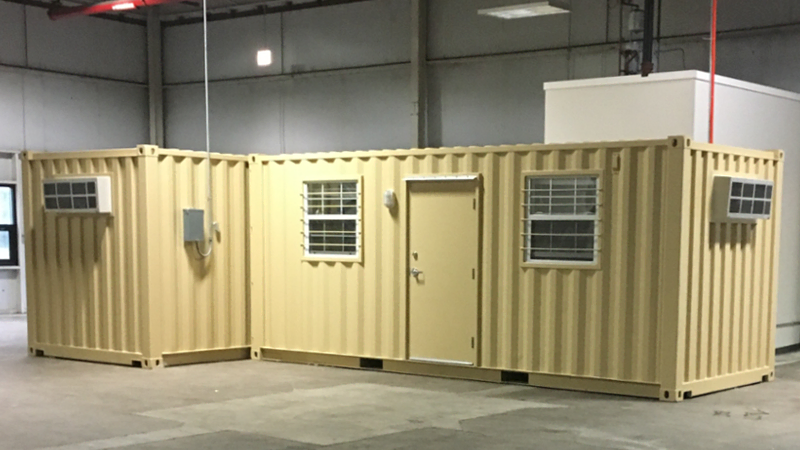 Your container office can be placed and ready for use in less than an hour. Bringing in a construction crew to wall off an area in your warehouse for office space can be a major disruption to the flow of warehouse operations that lasts months. If you have a flat, dry, and level surface—like a parking lot or concrete floor—you don’t need to worry about site prep. Instead, the fully finished-out shipping container office arrives around 8 weeks after you place the order, ready to be placed via forklift. 5. 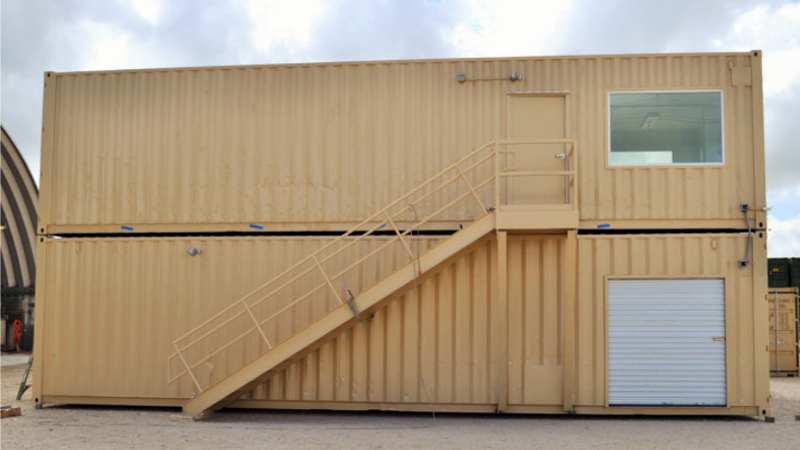 Container offices are easy to relocate around your warehouse. If you choose to keep your shipping container on a chassis, you can use a truck to tow the container wherever its most needed. For example, one warehouse manager kept their container on a chassis and parked it right next to the loading dock. People working the dock can quickly get in and out of the container, and if they had a high-traffic day, they could simply tow the container elsewhere in the parking lot. 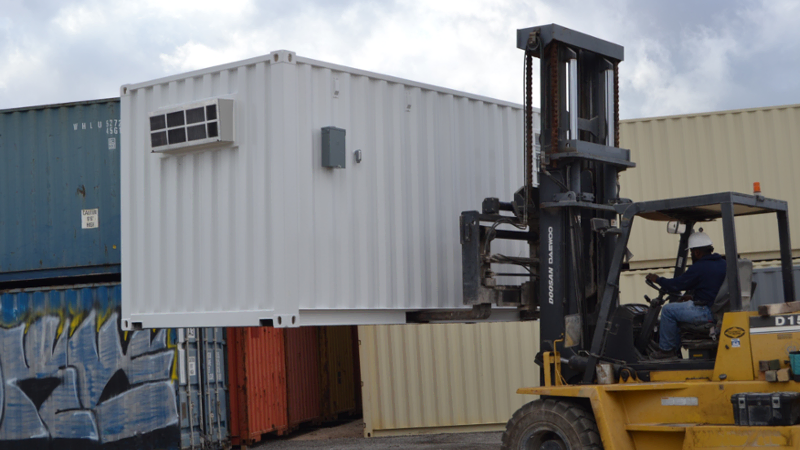 Even if the container sits directly on the ground, a short drive with a forklift can quickly relocate a container office. 6. Your computers and paperwork are secure. 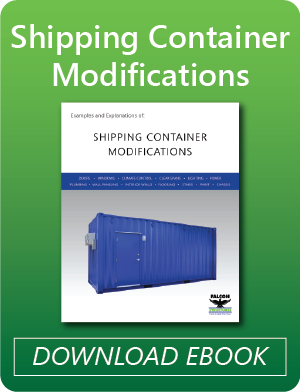 If you need to place your container in the parking lot outside of your facility, computers, paperwork and personal items will still be secure inside a steel shipping container. Options for key pads also keep offices secure without the hassle of cutting and distributing keys. Questions? Give us a call at 877-704-0177 or email sales@falconstructures.com.